A survey by the Office for National Statistics in May revealed that the British are changing their spending habits. Instead of filling our homes to the rafters with consumer durables and not-so-durables, we’re spending our spare cash on ‘experiences’, including recreation and, yes, culture. “People are interested in servicing a lifestyle rather than buying stuff,” one trend forecaster commented in The Guardian, while a senior executive from IKEA predicted gloomily: “In the west, we have probably hit peak stuff”. Does this mean fewer family trips to the mall and more museum visits? The contemporary museum sector certainly hopes so, and to bring the hope closer to reality it is doing it best to make the two experiences as similar as possible. This is an ambition not confined to Britain. Is it any coincidence that Rome’s two contemporary art museums, MACRO and MAXXI, have names like megastores? It wouldn’t surprise me if the Pompidou called its next outlet Géant Casino. The mallification of the contemporary art experience is international, but here in Britain, where entry is free, we lead the world. 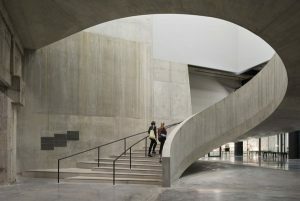 Last year Tate Modern logged 5.7 million visitors (don’t you love the precision of the decimal point?) and this year, with the added attraction and capacity of Herzog & de Meuron’s new Switch house extension, it’s hoping to swell attendance figures to over 6 million. Architecturally, malls and contemporary art galleries have much in common: both incorporate awesomely large atria designed to instill a sense of limitless possibility, and both feature fancy escalators and rubbish cafés run by stressed and underpaid staff. Ah yes, you say, but here your parallel hits the buffers: people go to shopping malls to shop. Not strictly true, is my reply: visiting malls is a leisure activity. People go to malls to look at stuff and at each other, especially when travelling up and down the escalators, much as the ancient Greeks did in the agora, though without the escalators. Window-shopping is a group activity, a sociable way of servicing a lifestyle. As an experience, the ONS might well put it in the same category as visiting Tate Modern. In the run-up to the Switch House’s opening we were forewarned that much of its 60% of extra space would be devoted to social interaction. Museums used to be about conservation. Now, with a minor anagrammatic rearrangement, they’re about conversation. Like shopping malls, contemporary galleries are places to hang out in, with the shop window or exhibition displays serving as talking points. As Jacques Herzog explained to The Observer about the design of the Switch House, “the stairs are wider than we need them; we want to invite people to have a different kind of experience than to rush from one gallery to another”. All well and good, but you can’t get round a gallery this size without rushing, especially not if you linger on the stairs. I lost the ability to focus less than halfway through, and I call myself an art critic. The problem is not just one of scale; the trouble starts, ironically, with the gallery’s departure from the mall model. Art galleries, like shops, used to be full of covetable objects ordinary people could fantasise about owning – modest-sized works, originally made for private consumption, put on public display for the benefit of the general population. The Switch House galleries are mostly full of large-scale works created with public display in mind. Like public sculptures, they are made for rushing past. The mystery of this so-called gallery extension which has so far cost £58 million of public money is how relatively little art there is in it: only three of its ten floors are exhibition galleries, four if you count the Tanks. But this didn’t stop the panel assembled for the press launch – including poor little Sadiq, whistled up at short notice as a multicultural mascot – from harping on about how transformative it would all be. It’s unfortunate that the most conspicuous evidence of the economic transformation so far triggered by the old Tate Modern should be Richard Rogers’s Neo Bankside luxury apartments with their litter of posh nosh outlets underneath. Looking south from Switch House’s 10th floor viewing platform, it’s hard to imagine the Tate’s regenerative effect rippling out towards the North Downs without the swathes of intervening social housing being swept away and replaced with Tory nastytecture and overpriced cafés. Bilbao has a lot to answer for. If the Basque government hadn’t hit the community jackpot with Frank Gehry’s Guggenheim Museum none of this would have happened. As it is, any city council in need of an economic boost reaches for the starchitects. The only city manfully resisting the tide seems to be Helsinki, still refusing to give the go-ahead to its Guggenheim outlet more than a year after the Paris-based architects Moreau Kusunoki won the competition to design it. Bilbao claims to have recouped the Guggenheim’s construction costs within three years of opening. Even allowing for some prestidigitous book-balancing on Bilbao’s part, there’s precious hope of Tate Modern repeating this feat, with a £30 million funding hole that still needs filling. On the eve of the Switch House’s opening, Serota as good as admitted to The Art Newspaper that if the Tate didn’t seize the opportunity of “unwrapping the building” to hook some late donations it would be this year, next year, sometime, never before the debt was paid. Slim chance of our new tightwad PM delivering on Osborne’s previous promise of an extra £6.8 million of annual funding – and extra funding will be needed, not just to service the debt. As with any expanded operation, the elephant in the gallery extension is the payroll. Billionaire donors who will happily part with capital to get their names on a museum building don’t give a stuff about the extra numbers of staff needed to keep it open. They leave such practicalities to museum administrators and the public bodies that fund them. If it came to keeping museum staff in jobs and pensions, your average billionaire would hand straight over to Dominic Chapell. In America, where more than $5 billion has been spent on museum expansion in the past nine years, administrators are getting wise. The Met, which reported a $10 million deficit this year, has mothballed plans for a David Chipperfield-designed modern and contemporary wing and, along with MoMA and the Brooklyn Museum, has announced plans to cut staff. The Met’s 2,300 staff – who, unlike museum staff in Britain, are properly paid – cost $200 million in salaries and benefits in 2013. MoMA, which spent $87 million on its 800 employees in the same year, has scaled back plans for a new extension. Double your gallery space and you double your warding costs, at least in theory. One reason, I suspect, why Tate Modern’s Switch House galleries are almost entirely given over to large sculptural installations is that they require less security – the worst you can do is steal a Carl André brick. Meanwhile the more vulnerable paintings and nickable sculptures have been squeezed into a few crowded galleries in the old Boiler House to save on warders. The dawn of the artist’s statement was bad enough; the arrival of the statement building has made things worse. Combine the two, and you get a tower of babble. Is the new Tate Modern worth the £260 million investment? If it ever has to charge for entry, we’ll find out.